ZHUKOVSKY (Moscow Region), July 20. /TASS/. Russia has completed the first stage of the state trials of the fifth-generation PAK FA (Perspective Airborne Complex of Frontline Aviation) fighter jet (T-50), Aerospace Force Commander-in-Chief Colonel-General Viktor Bondarev said on Thursday. "Today is an historic event - a preliminary conclusion has been signed at the MAKS airshow on the state joint trials of the first stage of the T-50 aircraft prototype. We are now switching to the second stage of trials. Also, we have received a recommendation on beginning the manufacture of the plane’s pre-production batch," the Aerospace Force chief said. 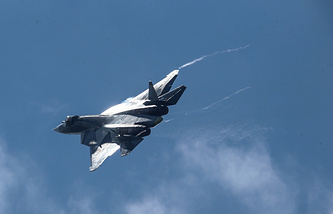 United Aircraft Corporation (UAC) Head Yuri Slyusar said at the MAKS-2017 international airshow on Wednesday that the pre-production batch of T-50 fifth-generation fighter jets would equal 12 planes. The T-50 (PAK FA) is Russia’s fifth-generation fighter, which took to the skies for the first time in 2010. It was earlier reported that the serial production of T-50 fighters would begin in 2017 and it would enter service with the Russian Aerospace Force.